In the lymphatic system the lymph node is a secondary lymphoid organ. A lymph node is enclosed in a fibrous capsule and is made up of an outer cortex and an inner medulla. Lymph nodes also have clinical significance. They become inflamed or enlarged in various diseases which may range from trivial throat infections, to life-threatening cancers. The condition of the lymph nodes is very important in cancer staging, which decides the treatment to be used, and determines the prognosis. When swollen, inflamed or enlarged, lymph nodes can be hard, firm or tender. Lymph nodes are kidney or oval shaped and range in size from a few millimeters to about 1–2 cm long. Each lymph node is surrounded by a fibrous capsule, which extends inside the lymph node to form trabeculae. The substance of the lymph node is divided into the outer cortex and the inner medulla. The cortex is continuous around the medulla except where the medulla comes into direct contact with the hilum. Thin reticular fibers of reticular connective tissue, and elastin form a supporting meshwork called a reticulin inside the node. B cells are mainly found in the outer (superficial) cortex where they are clustered together as follicular B cells in lymphoid follicles and the T cells are mainly in the paracortex. The lymph node is divided into compartments called lymph nodules (or lobules) each consisting of a cortical region of combined follicle B cells, a paracortical region of T cells, and a basal part of the nodule in the medulla. The number and composition of follicles can change especially when challenged by an antigen, when they develop a germinal center. Elsewhere in the node, there are only occasional leukocytes. As part of the reticular network there are follicular dendritic cells in the B cell follicle and fibroblastic reticular cells in the T cell cortex. The reticular network not only provides the structural support, but also the surface for adhesion of the dendritic cells, macrophages and lymphocytes. It allows exchange of material with blood through the high endothelial venules and provides the growth and regulatory factors necessary for activation and maturation of immune cells. Lymph enters the convex side of the lymph node through multiple afferent lymphatic vessels, and flows through spaces called sinuses. A lymph sinus which includes the subcapsular sinus, is a channel within the node, lined by endothelial cells along with fibroblastic reticular cells and this allows for the smooth flow of lymph through them. The endothelium of the subcapsular sinus is continuous with that of the afferent lymph vessel and also with that of the similar sinuses flanking the trabeculae and within the cortex. All of these sinuses drain the filtered lymphatic fluid into the medullary sinuses, from where the lymph flows into the efferent lymph vessels to exit the node at the hilum on the concave side. These vessels are smaller and don't allow the passage of the macrophages so that they remain contained to function within the lymph node. In the course of the lymph, lymphocytes may be activated as part of the adaptive immune response. The subcapsular sinus (lymph path, lymph sinus, marginal sinus) is the space between the capsule and the cortex which allows the free movement of lymphatic fluid and so contains few lymphocytes. It is continuous with the similar lymph sinuses that flank the trabeculae. 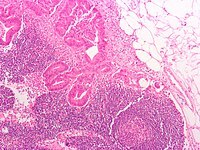 The lymph node contains lymphoid tissue, i.e., a meshwork or fibers called reticulum with white blood cells enmeshed in it. The regions where there are few cells within the meshwork are known as lymph sinus. It is lined by reticular cells, fibroblasts and fixed macrophages. The cortex of the lymph node is the outer portion of the node, underneath the capsule and the subcapsular sinus. It has an outer superficial part and a deeper part known as the paracortex. The subcapsular sinus drains to the trabecul sinuses, and then the lymph flows into the medullary sinuses. The outer cortex consists mainly of the B cells arranged as follicles, which may develop a germinal center when challenged with an antigen, and the deeper paracortex mainly consists of the T cells. Here the T-cells mainly interact with dendritic cells, and the reticular network is dense. The medullary cords are cords of lymphatic tissue, and include plasma cells, macrophages, and B cells. The medullary sinuses (or sinusoids) are vessel-like spaces separating the medullary cords. Lymph flows into the medullary sinuses from cortical sinuses, and into the efferent lymphatic vessel. There is usually only one efferent vessel though sometimes there may be two. Medullary sinuses contain histiocytes (immobile macrophages) and reticular cells. The primary function of lymph nodes is the filtering of lymph to identify and fight infection. In order to do this, lymph nodes contain lymphocytes, a type of white blood cell, which includes B cells and T cells. These circulate through the bloodstream and enter and reside in lymph nodes. B cells produce antibodies. Each antibody has a single predetermined target, an antigen, that it can bind to. These circulate throughout the bloodstream and if they find this target, the antibodies bind to it and stimulate an immune response. 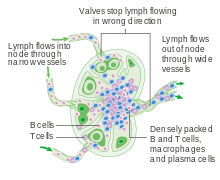 Each B cell produces different antibodies, and this process is driven in lymph nodes. B cells enter the bloodstream as "naive" cells produced in bone marrow. After entering a lymph node, they then enter a lymphoid follicle, where they multiply and divide, each producing a different antibody. If a cell is stimulated, it will go on to produce more antibodies (a plasma cell) or act as a memory cell to help the body fight future infection. If a cell is not stimulated, it will undergo apoptosis and die. Antigens are molecules found on bacterial cell walls, chemical substances secreted from bacteria, or sometimes even molecules present in body tissue itself. These are taken up by cells throughout the body called antigen-presenting cells, such as dendritic cells. These antigen presenting cells enter the lymph system and then lymph nodes. They present the antigen to T cells and, if there is a T cell with the appropriate T cell receptor, it will be activated. Lymph is present throughout the body, and circulates through lymphatic vessels. These drain into and from lymph nodes – afferent vessels drain into nodes, and efferent vessels from nodes. When lymph fluid enters a node, it drains into the node just beneath the capsule in a space called the subcapsular sinus. The subcapsular sinus drains into trabecular sinuses and finally into medullary sinuses. The sinus space is criss-crossed by the pseudopods of macrophages, which act to trap foreign particles and filter the lymph. The medullary sinuses converge at the hilum and lymph then leaves the lymph node via the efferent lymphatic vessel towards either a more central lymph node or ultimately for drainage into a central venous subclavian blood vessel. Lymph nodes may become enlarged due to an infection, tumor, autoimmune disease, drug reactions, or to leukemia. Swollen lymph nodes (or the disease causing them) are referred to as lymphadenopathy. Swollen lymph nodes may be seen, as in enlarged tonsils, or seen as gross enlargement of nodes due to lymphoma. They may be felt, or seen on a scan. Swollen lymph nodes may be painful or cause other symptoms such as a difficulty in swallowing or in breathing. When very large they may compress on a blood vessel. Swelling can occur in one node, in a localised area, or be widespread. ^ "What are lymph nodes". Siamak N. Nabili, MD, MPH. 2015-02-05. ^ "Lymph Nodes Directory". www.webmd.com. ^ a b Pocock, Gillian; Richards, Christopher D. (2006). Human physiology : the basis of medicine (3rd ed.). Oxford: Oxford University Press. pp. 252–253. ISBN 978-0-19-856878-0. ^ "Swollen Glands and Other Lumps Under the Skin-Topic Overview". Children.webmd.com. 2011-04-14. Retrieved 2014-02-28. ^ a b c d e f g Warwick, Roger; Peter L. Williams (1973) . "Angiology (Chapter 6)". Gray's anatomy. illustrated by Richard E. M. Moore (Thirty-fifth ed.). London: Longman. pp. 588–785. ^ Alberts, Bruce (1994). Molecular biology of the cell (3rd ed.). New York, N.Y.: Garland STPM. p. 1202. ISBN 978-0-8153-1620-6. ^ a b c Willard-Mack, Cynthia L. (25 June 2016). "Normal Structure, Function, and Histology of Lymph Nodes". Toxicologic Pathology. 34 (5): 409–424. doi:10.1080/01926230600867727. PMID 17067937. ^ Kaldjian, Eric P.; J. Elizabeth Gretz; Arthur O. Anderson; Yinghui Shi; Stephen Shaw (October 2001). "Spatial and molecular organization of lymph node T cell cortex: a labyrinthine cavity bounded by an epithelium-like monolayer of fibroblastic reticular cells anchored to basement membrane-like extracellular matrix". International Immunology. 13 (10): 1243–1253. doi:10.1093/intimm/13.10.1243. PMID 11581169. Retrieved 2008-07-11. ^ Katakai, Tomoya; Takahiro Hara; Hiroyuki Gonda; Manabu Sugai; Akira Shimizu (5 July 2004). "A novel reticular stromal structure in lymph node cortex: an immuno-platform for interactions among dendritic cells, T cells and B cells". International Immunology. 16 (8): 1133–1142. doi:10.1093/intimm/dxh113. PMID 15237106. Retrieved 2008-07-11. ^ Henrikson, Ray C.; Mazurkiewicz, Joseph E. (1 January 1997). Histology. Lippincott Williams & Wilkins. ISBN 9780683062250. ^ Hoffbrand's 2016, p. 103,110. ^ a b c Hoffbrand's 2016, p. 111. ^ Hoffbrand's 2016, p. 109. ^ Hoffbrand's 2016, p. 114. ^ Choices, NHS (2017-12-19). "Swollen glands - NHS Choices". www.nhs.uk. 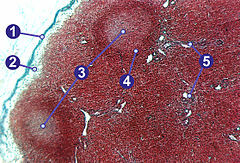 Wikimedia Commons has media related to Lymph nodes.